The faculty selection tool is used throughout FACULTY180 to filter and select faculty members, based on their assigned unit(s), employment status for a specific academic term, faculty title, login status, and faculty classification(s). This is helpful when creating reports, workflows, and processes. For some functionality, support accounts are also accessible using the faculty selection tool. By default, the standard faculty selection tool automatically locates all faculty members that meet the selected search criteria. 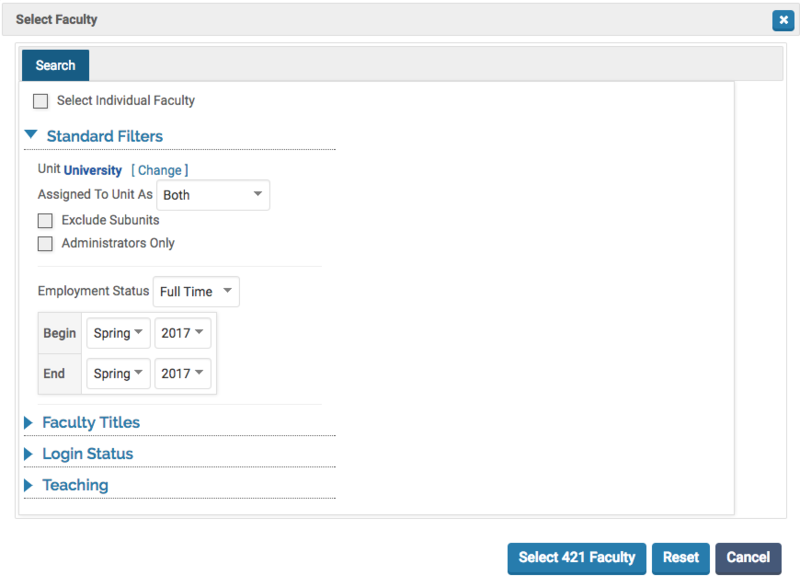 Upon performing a search, the number of faculty members located that meet the search criteria displays in the form of a button at the bottom of the screen. The names of the faculty members included in the search results do not display; therefore, there is no option to manually select individual faculty members from within the search results from here. Check the Select Individual Faculty check box. 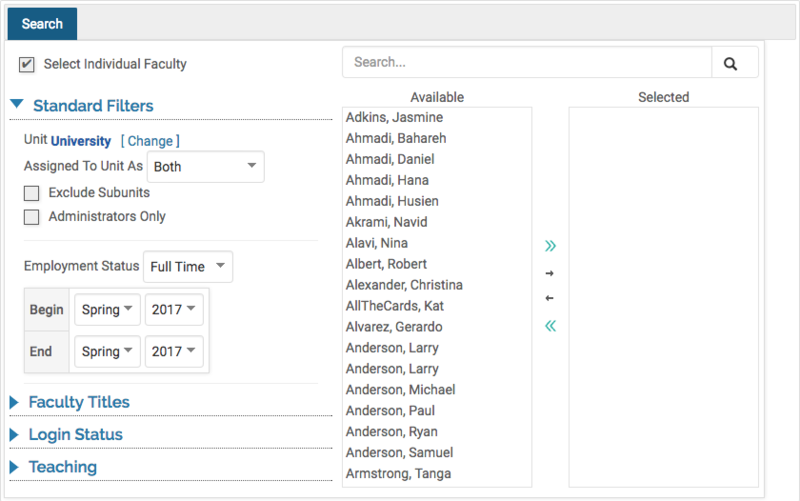 The number of all faculty members that meet the search criteria display in the Available column. Click on the number in the Available column to choose specific members from a list. 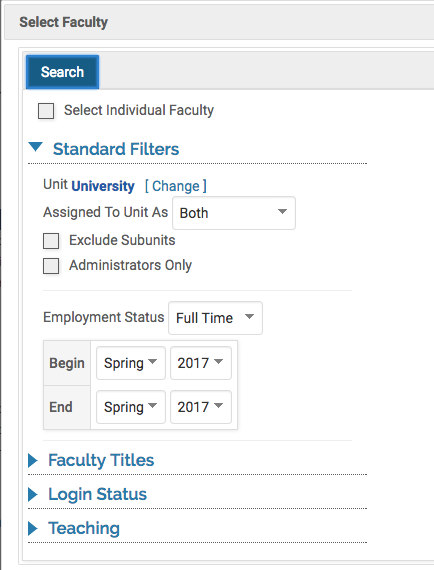 To select a faculty member, click the desired name, then click the single arrow icon to move the faculty member to the Selected column. To select more than one faculty member/administrator, hold down the Ctrl (or Command on Mac)key while clicking the desired names. You can also select all names from within the search results by clicking the double arrow icon. When you are finished selecting faculty members, click the Select Faculty button at the bottom of the window. Below is a short description of the different standard filters that are available within the Faculty SElector. Unit: Select the unit to be included in the search results. Assigned To Unit As: Display faculty members who are assigned to the selected unit as their primary unit, secondary unit, or both. Exclude Subunits: Faculty members who are assigned to the selected unit as a subunit will not be included in the search results. Administrators Only: Only faculty members who have administrator rights will be included in the search results. Employment Status: Select the desired employment status and academic term(s) to be included in the search results. Faculty Titles: If the search results should only include faculty members with a specific faculty title, enter the faculty title. Login Status: Specify if active, inactive, or all faculty members, based on their login status, should be included in the search results. Options are also available to filter by faculty members who have never logged on or have not logged on since a specific date. Teaching: Specify if faculty members with courses taught during the selected academic term(s) should be included in the search results. Faculty Classifications: Specify if faculty members assigned to selected faculty classifications should be included in the search results.